A most wonderful thing about exploring is the stumbling upon things that are new to you. In researching Charleston Lake and Killbear (our other destination this summer) I came across a new concept, a way of characterizing land with which I was already very familiar from camping (Balsam Lake, Big East Lake, Kawartha Highlands, Silent Lake, Bon Echo), from driving through countless times going north, and which is also beloved by cottagers in the Muskokas. This area is known as 'The Land Between', and as the name suggests it is the border between the populated southern Ontario and the northern Ontario wilderness. 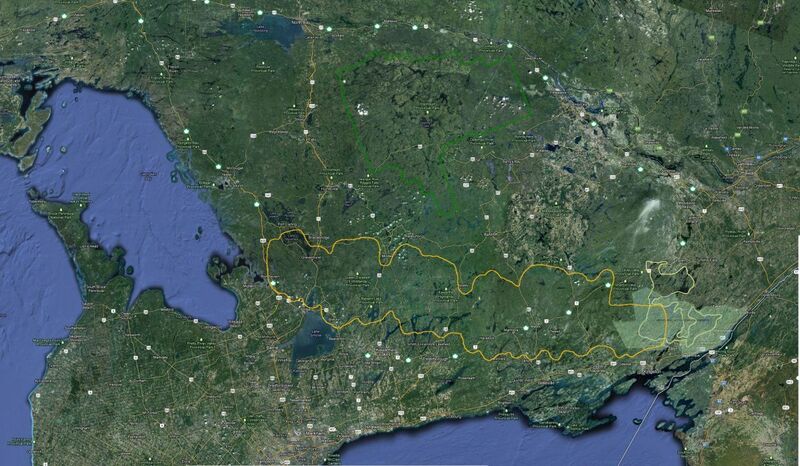 I superimposed the outline (in gold) of this area on a collated Google satellite view, along with outlines of Algonquin Park and the Frontenac Arch to better get a feel for it. Our summer camping destinations actually lie outside of this outline, one on either end, but the characteristics of this area will also apply somewhat to them.